Ganesh Chaturthi is a famous Hindu festival celebrated to honor the Lord Ganesh. This festival is also known as Vinayaka Chaturthi. Although this festival is famous all over India but in Maharashtra State, it is one of the biggest festival. During this festival, colorful pandals are setup and lord is worshipped for ten days. People also decorate their homes during this festival. Here are some simple home décor ideas to make your homes more charismatic and elegant during this festive time. Hanging torans on the door is considered auspicious for all festivals. Create a gorgeous entrance by putting some fresh flowers as a door hanging. It will make a feel good sense of the guest who is visiting your home. The most popular and easy way to decorate your homes with some fantastic candle. You can decorate the normal candles with some glitters or flowers. Put them in a glass. It will be a perfect home decoration option. 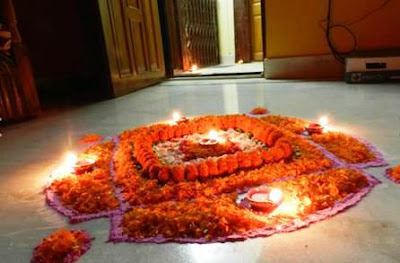 Prepare some creative and interesting flower Rangoli on the floor to catch the eyes of your guest. Add some diya with this to make the combination more attractive. You can make this creative Rangoli just in the entrance area of your home. 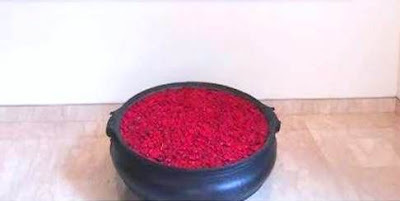 Take a big bowl or pot which has a wide opening. Fill some water on it and put some rose petals on it. Place the pot just beside the entrance of your home. Your home will blaze with flowers. 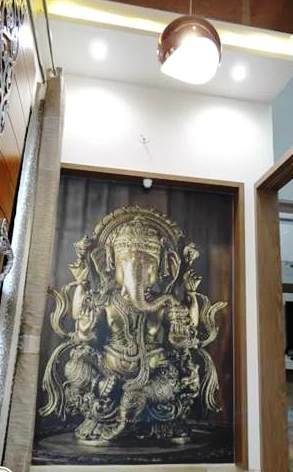 Another brilliant and new idea to put one 3D Lord Ganesh poster on the door. This 3D poster makes it like a real giant idol of lord Ganesh. You can put this massive 3D poster on the door frame on entrance area or at staircase area. Every house hold has some wall unit. It’s a very good idea to put some Ganapati wall paper on it and put some artificial flowers and some LED bulb on it. Also, you can use some traditional Hindu symbol like “Swatik” or something like that to make it more interesting. This is a super cool idea to decorate the puja area. If you have money plant at your home just place those in a semi-circular fashion around the idol. 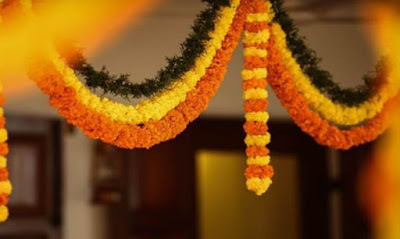 This leaves can give you a bright look to your puja area. This will also help you to go for an Eco-friendly Green Ganesh Chaturthi celebration. This may be an old idea but still, the look they impart is very nice. 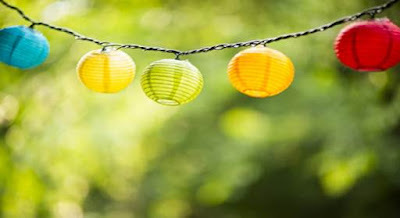 You can do a lot of experiment with this unique décor idea with a paper lantern. Although it’s not a good idea to use thermocol because this is not an environment-friendly material but there are a lot of decoration we can do with thermocol. You can paint with some colors on it to make it more glitter. You can use these colorful scarfs, dupatta or chrunis or any other material which may match with the theme of decoration. You can always the option to mix and match to see how they look. Finally, you can add some flowers or ribbons on it to get the ultimate touches. 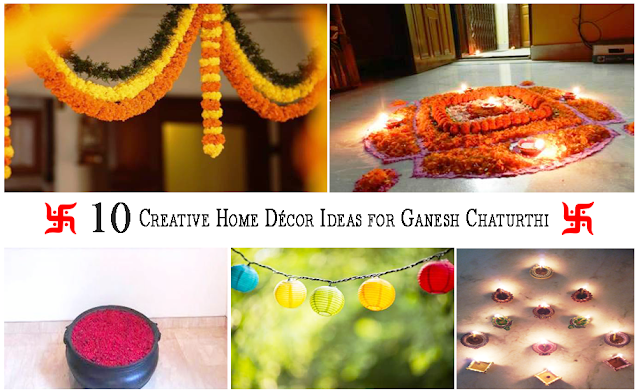 There are many ways to decorate your home for Ganesh Chaturthi and we have discussed some of the tips that can be implemented easily. It’s up to you which way you want to decorate your home. Enjoy the festival time. Have a safe and prosperous Ganesh Chaturthi ahead. We 5 women bloggers have come up again with our #festiveblogging series of blog posts. I’m sure you will love this series like our past series ✌💯 #ganpatiblogging. Read all the wonderful entries by my fellow bloggers below. Wish you a happy Ganesh Chaturthi and thank you for sharing these ideas ! I enjoy making flower toran and flower rangoli during festive season! 😀 It's fun! Nice post.very creative and helpful ideas. But I love that flower rangoli very much. I love this God and love his festival. Beautiful decor ideas here.